I haven't seen a thread about this yet, but.. anyone else into vintage corduroy? It certainly has a long, tumultuous (i.e., the 1970s) history, but it definitely has a place of honor in 19th century workwear/hunting gear, a subject dear to many of our hearts. I notice that it is much harder to find a cool pair of repro workwear cords than say, a pair of ducks. I recently saw corduroy pop up in Christophe's Men of the Frontier line. rtt-did you see the jacket that matches those pants..badass. 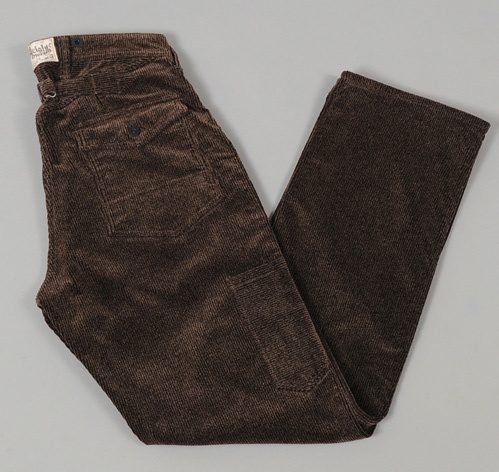 I have always liked corduroy, but don't know much of it's history, although I like many of the repro pieces I've seen. I am unfamiliar with whether a true vintage version exists , I wonder if Levis Red or Made and Crafted made what you saw? I know in years past M&C has done several takes on the type 1 in non-traditional materials. This is a bit of a mash-up, can't tell if its 'no wale' cord. Obviously the zipper is not historically accurate but maybe this was something kind of like what you saw? There was a sack coat too -- can't remember if it was cord or just a sort of cotton drill. I saw one of those on ebay about 6 months ago. I remember it appearing just as you described but also had some subtlle bomber stylings to it... if i remember correctly anyway. I remember it being slightly darker than what I would call tan. Anyhow, it was listed as a 1930s levis corduroy jacket. I would have bid on it but it was a size too small for me. I think the auction ended without bids. It was hard to tell if it was authentic or not, i assume a lot of people passed on it solely based on skepticism. ^ oh yeah, and my favorite cords of recent are Beams + cropped cord trousers which were sold at union made last season (not anymore though.) I got myself a pair of those in navy blue during the end of season sale. they came in sizes small, medium, and large... each spanning the usual run of waist sizes and have side cinches to cinch down to your specific size. They came significantly cropped and cuffed and in my opinion, have a great fit. I haven't got any, but at some point I'd like to get a pair in moss green and possibly navy blue too.